Sewage treatment compliance is a growing concern for local councils and state government. It is their task to regulate commercial onsite wastewater treatment plants and make sure they are working correctly. The problem is widespread. Many systems are undersized, outdated or mismanaged. Furthermore, they are simply not designed for the effluent strength and volumes they receive. Council officers from the Northern NSW Councils meet annually to share information. They work together to improve the management and compliance of Sewage Treatment Plants (STPs) in the region. The group known as “The Poo Boys” includes; Clarence Council, Ballina Council, Richmond Council, Lismore Council, Kyogle Council, and Tweed Council. 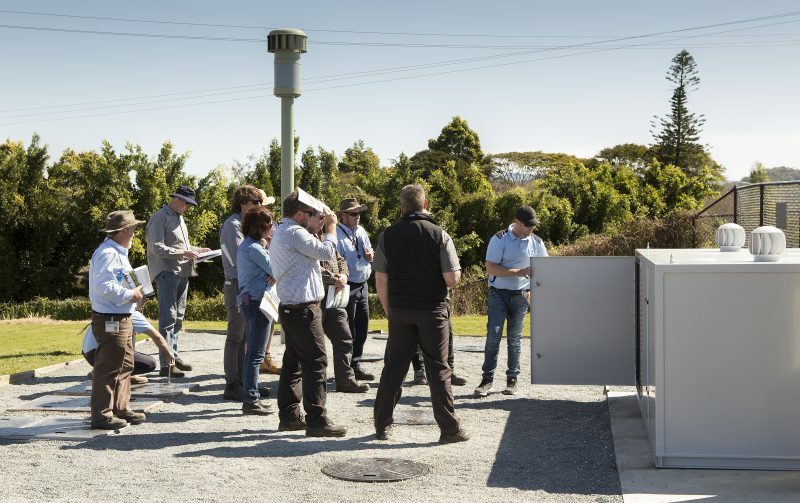 With the majority of commercial STPs in northern NSW failing to comply with standards, the Councils are looking for wastewater treatment solutions that work. Hutchinson Builders engaged True Water Australia to design, manufacture and install the onsite sewage treatment system for the Chinderah Service Centre. When True Water took on the job, the specifications of the tender were flawed in terms of the sewage treatment system . Through close consultation with the Tweed Council and clear communication with the client, the Wastewater Consultancy team were able to come up with a design that best meets the needs of the project. The packaged treatment plant processes wastewater from the entire development and discharges the treated water within a small area. 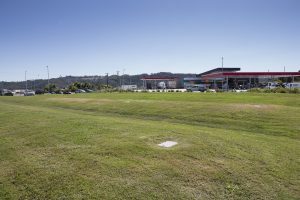 The service centre includes a Caltex fuel outlet, Caltex Star Mart, Truckers Lounge, public amenities and a fast food Convenience Hub including McDonalds, KFC, Oliver’s and The Coffee Club. The highway service centre has a high volume of traffic using its services. The 4 hectare site sits between the Pacific Highway and Tweed Valley Way in Northern NSW. It was important to provide a solution that would stay operational during severe weather events as the site is flood prone. This was particularly challenging as the site is 90% concrete apron hardstand and has a high water table. 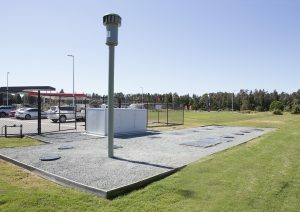 In 2018 the Tweed Shire Council selected this service station STP as a model example of commercial onsite wastewater treatment. Council officers from across Northern NSW attended the site as part of a full day of information sharing. 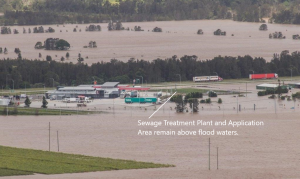 The Tweed Council chose to highlight the project as an example of ongoing sewage treatment compliance under extreme conditions. Tweed Shire Council asked True Water to arrange an inspection of the Chinderah 40kL STP for a training and information day. A large group of staff from various Northern NSW councils attended. They discussed every aspect of the design, delivery and operation of the True Water sewage treatment system with a detailed inspection of the site. True Water’s Design and Consultancy Manager, Jim Mahoney, was onsite to discuss the challenges and key considerations of the site. Jim advised that True Water were faced with flawed tender specifications when they first took the job on. They worked with Tweed Council and the client to redesign and deliver a system with twice the capacity. Importantly, they kept the redesign within the client’s budget. Daniel Mahoney, Works and Service Manager for True Water, took the council officers through every component of the Kubota STP. From the inlet works and stainless piping, to the high quality electrical and telemetry monitoring systems. A walk over of the 1600m2 mound system completed the inspection. Daniel detailed the steps True Water take to deliver systems that can provide 50 years of compliant operation. Tweed Shire Council’s Onsite Sewage Specialist, Grant Malcolmson, addressed the group to conclude the visit. He stated that Council had never received a complaint from the public about the Chinderah plant. Even though it is the largest and most visited private STP in the Shire. Council made the decision to carry out unannounced inspections of the site because it is very unusual to have no complaints. Council officers went to the site many times to check on operation and compliance of the STP. Grant was happy to confirm the system was always working as designed. Grant congratulated True Water on the redesign and delivery of the system and compliant operation of the plant. The True Water Wastewater Consultancy team designed the Chinderah Caltex STP for a minimum 50-year life cycle. We allowed for peak loading during busy holiday periods and a rise in the number of visitors to the service centre over the coming years. Initially, our system is designed to treat up to 40kL per day. It can also be expanded in the future to treat up to 100kL’s per day. Kubota’s unique modular design makes it simple to forward plan for future expansion. During the design phase, our Wastewater Consultancy team reduced the Land Application Area footprint by two thirds. This was achieved by specifying the use of a Kubota system along with specially designed Sand Mounds to disperse the treated effluent. This also kept the Land Application Area above flood level, removing the need for wet weather storage. This design was not only more suitable to the site, it also saved our clients time and money. Kubota guarantees ongoing operational performance of the treatment plant. Our Service Team performs detailed quarterly inspections to assess ongoing performance. In addition, a remote monitoring plan and continuing education of stakeholders has meant trouble-free operation of the whole system. True Water is proud to have our work recognised by these councils for quality and compliance.